Now that fall is in full-swing, many are starting to notice a wide array of creatures, insects, and pests. While the trees are lined with colorful displays of the crisp, cool season, many lawns and homes are becoming lined with pests and becoming a nuisance to humans. In the past couple of weeks we have covered spiders and mice in our “Fall Pest Guide”. This week, we are going to place our focus on stink bugs. Immediately following the winter months, these creatures become alert and active. By the time fall arrives, the insects are working diligently to enter into homes, garages, and other structures in order to prepare for the upcoming winter. In part 3 of our “Fall Pest Guide”, we will expound on these insects and inform you of the steps that may be taken to prevent and eliminate infestations. According to research, there are 4,700 different species of stink bugs in the entire world. In the United States and Canada, approximately 250 species exist. 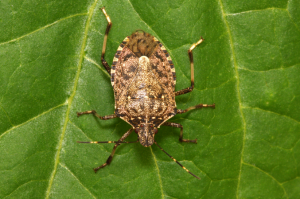 The most common stink bug that is currently impacting homes in the United States is the brown marmorated bug. It got its name from the brown marbled-colored pattern located on its back. Stink bugs have striped antennae and a striped pattern located on the abdomen and shoulders. The body has a total of five sides and measures nearly an inch long. Stink bugs secrete an extremely foul smelling substance when they are disturbed, frightened, or squashed. In most instances, these insects will not emit any type of odor. When an odor is emitted, it is because they are attempting to protect themselves. While considered to be a nuisance because of their smell, stink bugs are actually not at all harmful to humans. The most annoying aspects to stink bugs (apart from their putrid smell) is their diet. They consume plants, fruits, legumes, and various types of ornamental plants. It is also common for the insects to consume weeds and the leaves on various types of trees.